Are you taking your fish oils? An interesting read for anyone taking fish oils or considering supplementation. Bear in mind this is an observational study and definitely not without flaws. Training in Olympic weightlifting into the old age- heading for 41 in a few months- suffering from pains and aches to my knees, shoulders, elbows, wrists and back is not that uncommon. Luckily, they are not all affecting me at the same time. They come and go in waves; some days I will wake up with pain in one place and by the end of the day it will have somehow either subsided or travelled to a different part of my body. As you might guess, I’m kind of used to my body aching and after a while you’ll probably get used to it too. However, mild soreness and discomfort that comes and goes is different to persistent pain that interferes not only with training but also with activities of daily living. At times and particularly after heavy training sessions, Delayed Onset Muscle Soreness (DOMS) and joint aches are extremely intrusive. Training is hindered, recovery times increase exponentially and following any program is more of a far-fetched wish than an actual effort. Pulling and pushing doors, sleeping on any one side for longer than a few minutes or even sitting on the couch can also become a challenge more often than not. Essential Fatty Acids (EFAs) and vitamin D supplementation: For the sake of mentioning these already, I can only sum up my experience in one word: no. Back in 2009, I took part in a vitamin D study where, over a period of 24 months, my levels were monitored every 3 months and maintained between 40-60ng/ml. Although before the study my levels averaged at below 20ng/ml, I noticed absolutely no difference 2 years later and at levels averaging 3-fold my pre-study norms. Immune response and susceptibility to cold virus and flu did not improve; neither did muscle or joint pains. I should mention at this point that, concurrently with the study medication, I was also taking 4000-5000mgs of EFAs [Eicosapentaenoic Acid (EPA) and Docosahexaenoic Acid (DHA) - commonly known as fish oils]. As magnificently as these abovementioned supplements are marketed, they are on my waste-of-money list. Glucosamine hydrochloride (glucosamine) and sodium chondroitin sulfate (chondroitin): Yeah I wouldn’t really put my money in these either. Following the vitamin D study/ EFA-supplementation, I tried these separately and in combination (1500mgs glucosamine and 1200mgs chondroitin) for 6 months. Improvement: nil. Non-steroidal anti-inflammatory drugs (NSAIDs): Now we are talking! NSAIDs such as oral aspirin, ibuprofen or naproxen are great for headaches, of which you will undoubtedly develop many banging your head against the wall when your shoulder hurts so much you can’t hail a cab, but haven’t done much for me in terms of reducing inflammation. Diclofenac, on the other hand, also a NSAID, is a gift from the Gods of painkilling. That is if you are ok popping the tablets or injecting yourself. The only time my pain subsides with Diclofenac cream is when pretty girls cover themselves with it in TV ads but does not do anything for my severe rotator cuff tendinopathy when applied directly. 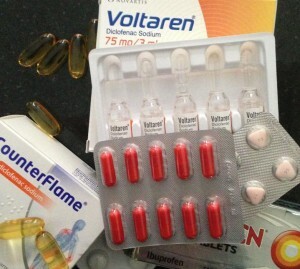 I started using diclofenac tablets (75mg/twice daily) when I hurt my knees years ago and it did wonders for me. I took it in cycles of 4-5 days at the time, with small breaks in between, for almost a year. It relieved the pain and swelling in a matter of days and enabled me to walk and train pain-free. Also, when a severe back injury rendered me bed-bound for a week, suppository diclofenac (150mgs) in combination with diazepam (6mgs) made me forget that getting up to go to the toilet unassisted was just not going to happen. Well, maybe the effects of the benzodiazepine were more of a factor here. Recently, I have also tried it for shoulder pain and although it works, it does not have the same effect it did on my knees or back. So although oral/suppository diclofenac seems to be overall effective for most joint pain, it holds very little compared to the intra-muscular (IM) injectable form. IM diclofenac, in my experience, is the king of NSAIDs. Surely because of the rate at which the drug is release into the blood stream, it makes it by far the best and most effective NSAID I have ever tried. It comes in concentrations of 75mg/3ml only suitable for gluteal sites or 75mg/1ml concentrations suitable for deltoid sites. The chances your GP will prescribe you an injectable preparation of diclofenac are close to zero in this country in comparison to other European countries where diclofenac in all preparations is sold over the counter and widely available. Best case scenario- the referral will land you at the steps of an orthopaedic specialist with a background in sports-related injuries and he will prescribe/administer injectable diclofenac followed by a course of oral preparation. Cortisone: Ah…the black sheep of the anti-inflammatory family but for me left last because it is by far the best anti-inflammatory treatment I’ve received. I’ve heard loads of people and read of twice as many complaining of side effects following cortisone injections and maybe I was lucky to have the procedure carried out by a skilled surgeon rather than nursing staff or my tolerance levels are bit higher than normal but I can’t praise it enough. Being injected directly into the subacromial space of the inflamed joint, in my case the left shoulder the effects of the solution (a combination of 80mgs DEPO-Medrol and 1% Lignocaine) were quick and total. The only very-welcome side effects I experienced were a bit of head-buzzing and the ability to mobilize my arm almost immediately without agonising pain. Whether the injection is guided or not- I have tried both- I can say that it is a greatly effective medication when administered correctly. Up to now and although I have been offered/suggested surgery by most orthopaedic consultants I have met, I have yet to go under the knife. Eventually, I will succumb to surgery as the wear and tear becomes more pronounced and I run out of options but not for a while. In the meantime, I hope you never experience pains or aches necessitating injectable treatment but if you do, don’t hesitate to give cortisone a try. Best coach in Italy. 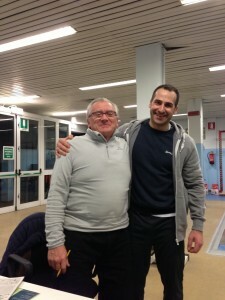 This man has produced more national champions than any other Italian coach and 9 of the students he currently coaches at his gym compete for the national squad. I train with him whenever I visit home back in Italy.